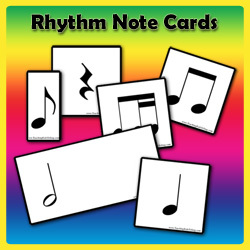 These rhythm cards are a wonderful aid in teaching children note values, rhythm, and the relationship of notes and rest. Each card is sized according to the note value, which gives children a good visual reminder of the duration of any particular note. These rhythm cards are a wonderful aid in teaching children note values, rhythm, and the relationship of notes and rest. Each card is sized according to the note value, which gives children a good visual reminder of the duration of any particular note. Use them to create rhythms, play games, or to demonstrate the relationship between different note values.